Leveraging on our multifaceted infrastructure facility; we manufacture and export vast array of Construction, Mining & Pumping Machines. The offered products are manufactured employing latest machines and advanced technology. Our range is applauded by customers for its high performance, longer service life, minimal maintenance and sturdy construction. These products are widely used in mining, water well drilling and construction equipment. We are one of the leading organizations that is engaged in manufacturing, supplying and exporting a vast array of Drilling Rigs. All our products are manufactured using excellent quality material that is sourced from most trusted vendors of market. Our reasonably priced range is extensively used in multi-national engineering and mining industries. 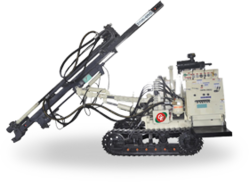 Under this category; we offer DTHR 450, DTH 300 Drilling Rig, DTHR 300 and Getech Auger Drill Rig. 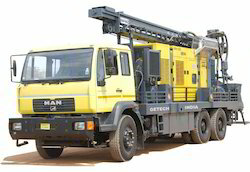 Skid Mounted Core Drilling Rig. To meet the diverse requirements of our esteemed clients, we are manufacturing and exporting a comprehensive range of Blast Hole Drilling Rig. Offered array of blast hole drilling rig is manufactured by our experienced professionals in complete compliance with the international quality attributes. It is widely used for drilling 4 ½ inches diameter holes up to 30 meters depth. Further, our clients can avail these rigs from us at industry leading prices. Manufacturer & Exporter of Mineral Exploration & Pole Hole Drilling Rigs. Our product range also comprises of Drilling Rigs, Blast Hole Drilling Rig. Available with us is an incredible range of Tools and Accessories. Manufactured using optimum-grade material, these products are in adherence with international quality standards. All our reasonably priced products are applauded for their fine finishing, longer service life and corrosion resistance. 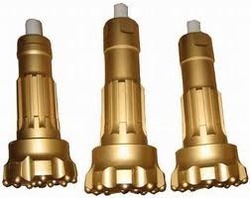 Under this category; we offer DTH Hammers, DTH Button Bits, Rock Roller Bit and Cluster Hammers. We are a leading Manufacturer & Exporter of Core Drilling Accessories such as Core Drilling Rods, Core Barrel, Core Dril Bits, Casing Pipes, Tractor Mounted Core Drilling Rig, Tractor Mounted Water Well Drilling Rig and many more items from India. We are a leading Manufacturer & Exporter of Mud Rotary Drilling Accessories such as Tricon Rock Roller Bits, Drag Bits, Stabilizer Drilling Tool, Hole Opener, Conversion Subs, Drill Collar and many more items from India. We are highly appreciated in the international market for our qualitative range of Drill Rods and Pipes. These offered products are fabricated using supreme quality material that is sourced from vendors of high repute. Post-production, our range is stringently inspected on certain parameters of quality in order to rule out every possibility of defect. All our products are applauded for super toughness, durability, performance, corrosion & chemical resistance. Our range comprises Friction Welded Drill Rods and Friction Welded Drill Pipes. We hold expertise in manufacturing, supplying and exporting a superior quality range of Hand Pumps. Manufactured using excellent quality material, our range is in compliance with international quality standards. The material used in the manufacturing process is sourced from most trusted and reliable vendors of market with the aid of our procuring agents. These products help in providing ground water. Under this category; we offer Handpump, Hand Water Pump, Afridev and Extra Deep Well. We are looking queries from International market. Ours is a renowned organization, which is engaged in manufacturing and exporting a comprehensive range of high grade Mud Pump. Manufactured by our engineers in complete compliance with the industry laid standards & norms, these pumps are available with us in various configurations. These pumps are widely used for the water-well & diamond core drilling and Mines dewatering applications. Owing to our experience, we have been successful in catering to the requirements of our esteem clients by offering high quality Industrial Terrameter. These products are manufactured using finest quality material and components that are sourced from most trusted vendors of market. Our product-line is used for checking water level up to 100m – 1000m depth. All our products are applauded for their durability, corrosion resistance and high performance. In our range; we offer Abem Terrameter and Terrameter. Backed by rich industrial experience & knowledge of this domain, we are manufacturing and exporting a qualitative range of Water Level Indicators. Our experienced professionals have manufactured these water level indicators using high-grade raw material and components in compliance with the industry laid standards & norms. Available with us in various configurations, offered products are widely used in the various industries to keep an eye on the level of water. Manufacturer & Exporter of Mounted Drilling Rig & DTH-200 Mounted Drilling Rig. Our product range also comprises of Drilling Rigs, Blast Hole Drilling Rig and Mineral Exploration. Manufacturer & Exporter of External Upset Drill Rods. Our product range also comprises of Drilling Rigs, Blast Hole Drilling Rig and Mineral Exploration. Leading Manufacturer and Exporter from Hyderabad, our product range includes Core Dril Rig such as Drill Rods, DTH Drill Pipes, Drilling Pipe and CDR 400.